I wouldn't normally write a review warning others not to watch an anime, but this twenty-six minute "movie" got me so worked up I was yelling at my computer, appalled at the incoherent mess in front of me. If you can get past the bland, colorless world and poor animation, you will soon find that Yuukai Anna's appearance is far from the worst thing about it. 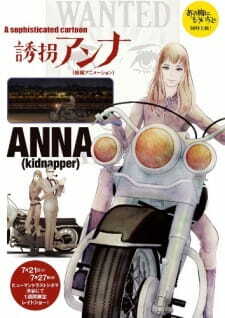 Our protagonist, Anna, is a notorious kidnapper and the anime opens with her on her motorcycle busting through a stained glass window high above the altar of a packed church as a man and woman are about to seal the deal. This is where the red flags started going up for me as shards of glass are flying everywhere and nobody suffers so much as a scratch. Immediately she's riding out the church front door with the groom's hands bound on the back of her bike. The congregation meanwhile is screaming and running outside in fear EVEN THOUGH ANNA JUST LEFT as though the church were on fire (which it's not). We're supposed to believe Anna was able to land safely, park her bike, get off, overpower the groom, bind his hands, force him somehow to sit down and stay still long enough for her to get back on the bike and ride out of the church all without the bride or a single attendee attempting to stop her. At any time the groom could just hop off and run away before the bike gained too much speed, foiling the whole premise of this show. The rest of the show is just as baffling as the intro. The story makes no sense, the art is hard to look at when it's not comedically bad. There is some pleasant jazz but most of the show does nothing interesting audibly. The characters and their motivations are entirely incoherent, and there is no joy to be gained from watching this except from 9:32 where Anna makes a really funny facial expression. 1/10 since MAL can't go lower. It's a rather short yet baffling movie. If you can get past it being CGI (which can make or break it for you, if you can take it it's fine, but it's more than understandable if you find it ugly, I feel the faces make it work for me, more because of taste since they're also not very expressive), it has some nice palettes throughout, with very lush lighting in some segments that is the reason why the CGI field is so promising in the first place, it's a short, a little bit spicy and confusing ride of an unlikely couple. The characters have some potential were they to be explored outside of this movie, but it ends in what's possibly the most what in the goddamn way imaginable. I won't spoil it, but I honestly have no idea what kinda payoff they wanted us to have coming out of it. I didn't hate it, it's not the worst thing ever and it could've had a lot of potential, but instead it's just a confusing little piece. Probably wouldn't recommend it unless you're a bored completionist like me.